Ah yes, the Neopian pound, a place to find your dreamie or pick up a nice painted pet. Unfortunately, this is mostly what the pound is used for. Pets that get adopted are usually painted, well named, limited edition or un-converted. Boards are constantly made for listing pets that are painted a certain color or searching for a certain name, yet what happens to all of the pets left over, the basics. That is what we are here to solve and get turned around. Imagine walking into the Neopian Pound and looking behind the corner. There behind the pretty pink Uni are rows and rows of cages, all filled with unhappy pets and miserable attitudes. What would you do if you were one of those pets, once loved (if you were lucky) and now shoved in a cage in some pound, waiting, hoping that one day a nice person will come by and adopt you? Would you want that to be you, living every day in a slight bit of hope that you might get adopted and then having that faith crushed when you are passed up for a Maraquan Cybunny? We can help these pets; we just need to take the first step. Pound Reason 1- Let's start off with when you start out your account on Neopets. The pets you start out with are generally basic and poorly named; these pets then soon get dumped in the pound when the user finds painted pets. The newbie’s pack comes with two basic paintbrushes and many items, but these paintbrushes will still leave your pet a basic. There are many cheap paint brushes out there that can paint these pets different colors, but new users don’t necessarily know that; these pets then usually end up in the pound. Pound Reason 2- Many people create pets to zap with the lab ray and they quickly give up as they keep getting stat boosters instead of species or color changes. As the process continues, if the owners do not get a good zap, they tend to get bored with the pet and leave it aside, forgetting about it. Then one day they see a nicely named plushie in the pound and need to make room. Guess which pet gets dumped, yes, the basic zapping pet. Then the pound has adopted out a frequently sought out pet and taken in a basic pet no one cares for. What a shame. 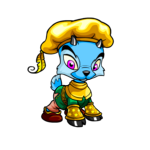 Pound Reason 3- I have seen this many times; people create a pet to make a Battledome pet and if it gets sick, they may not have the money to cure it. Also, people may create a pet for a certain avatar and then put it in the pound. People tend to create pets for these things and then see it’s not worth finding them new homes or curing them, so they wind up in the pound. This adds greatly to the population in the pound. So that leaves the question, how do we take the Neopian Pound and turn it around? Well, there are a few simple solutions to this predicament. Solution 1- The solution is also one of the problems. The lab ray is a great way to help these poor pets. You can help by simply searching the pound and finding pets you would like to zap. These pets can then be changed into pets with cool colors and intriguing species. As an added bonus, the lab ray will most likely raise your pet’s stats to enhance the probability of it getting adopted. The lab ray is not always the quickest solution, though; finding a good color and stats may take a bit of time. Therefore, it is recommended that you do this if you can come on about every day. This is a very easy and efficient way to make sure an abandoned pet can get adopted. Solution 2- Many guilds these days are dedicated to our specific cause. They have invested loads of money into buying many lab maps and many members are constantly zapping pets and repounding them or putting them in their own guild pound. This is a very efficient and effective way because it helps many pets all at the same time. If you are interested in helping pets from the pound, you may want to look into joining one of these guilds. Solution 3- Has anyone thought of not abandoning their pets? What about not letting Dr. Death come and take your pets? I think that if we put a little bit of effort into our pets, we could make them something we are proud of, not wanting to throw them in the pound but to show off and gloat about on the boards. How about fewer pounding boards and more adopting ones! What if we took the little while to save up just enough neopoints to buy a paint brush for them? Wouldn’t that be better? As a conclusion, let’s just look at the opening sentence at the Neopian pound. “Cruel, irresponsible pet owners can abandon their neopets and hope that someone will eventually come along and care for them.” Does that sound very reassuring that your pet will be happy and have a good life at the pound? It doesn’t to me. If we can keep pets out of the pound, that will change the whole way Neopia is run. Pets will no longer be abandoned all the time and thrown away to hope to be adopted. Possibly things could get easier if the price of painting devices like the lab map were easier to acquire, but nonetheless it is our duty to protect the neopets of Neopia and make sure they all have responsible and caring pet owners. Beneath every pet is a dreamie waiting for someone to unleash it.